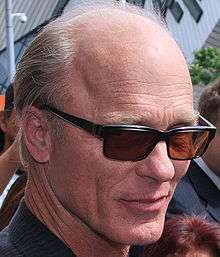 Edward Allen "Ed" Harris (born November 28, 1950) is an American actor, producer, director, and screenwriter. He is known for his performances in films such as The Right Stuff (1983), The Abyss (1989), Glengarry Glen Ross (1992), Nixon (1995), The Rock (1996), Absolute Power (1997), A Beautiful Mind (2001), Enemy at the Gates (2001), Radio (2003), A History of Violence (2005), Gone Baby Gone (2007), The Way Back (2010), Man on a Ledge (2012), Gravity (2013), Snowpiercer (2013), and Run All Night (2015). Harris currently stars in the HBO sci-fi drama series Westworld, as well as Alejandro G. Iñárritu's upcoming Starz drama series The One Percent. Harris is a three-time nominee of the Academy Award for Best Supporting Actor for his performances in Apollo 13 (1995), The Truman Show (1998), and The Hours (2002). He was nominated for an Academy Award for Best Actor for playing artist Jackson Pollock in his directorial debut Pollock (2000). He also won a Golden Globe Award for playing Senator John McCain in Game Change (2012). In 2015, Harris received a star on the Hollywood Walk of Fame. Harris was born November 28, 1950, at the Englewood Hospital in Englewood, New Jersey, and was raised in Tenafly, New Jersey, the son of Margaret (née Sholl), a travel agent, and Robert L. "Bob" Harris (1922–2014), who sang with the Fred Waring chorus and worked at the bookstore of the Art Institute of Chicago. He has two brothers, Paul and Robert. Harris was raised in a middle class Presbyterian family. His parents were originally from Oklahoma. He graduated from Tenafly High School in 1969, where he played on the football team, serving as the team's captain in his senior year. Harris began his career on the stage. Harris' first film role came in 1978 with a minor part in the suspense film Coma, starring Michael Douglas. His first major role in a film came two years later with Borderline (1980), in which he starred alongside Charles Bronson. In 1981, Harris played the lead, William "Billy" Davis, a king of a motorcycle-riding renaissance-fair troupe (a role modeled after King Arthur), in Knightriders. The following year, he co-starred as Hank Blaine in the black comedy horror anthology film Creepshow, directed by George A. Romero. In 1983, Harris became well-known after portraying astronaut John Glenn in The Right Stuff. In 1984, he co-starred in the Robert Benton-directed drama film Places in the Heart; during production of this film, Harris met and married his wife Amy Madigan. In 1986, he received a Tony Award nomination in the Best Actor in a Play category for his role in George Furth's Precious Sons. He also won the Theatre World Award and Drama Desk Award for Outstanding Actor in a Play for his performance. Harris then portrayed William Walker, a 19th-century American who appointed himself President of Nicaragua, in Walker (1987). That same year, he played the main role of Harry Nash in the HBO television thriller film The Last Innocent Man. In 1989, his role as David "Dave" Flannigan in Jacknife earned him his first Golden Globe Award nomination, for Best Supporting Actor – Motion Picture. Also in 1989, he portrayed Virgil "Bud" Brigman in the sci-fi film The Abyss, directed by James Cameron. In 1992, Harris co-starred as Dave Moss in the drama film Glengarry Glen Ross, based on the play of the same name by David Mamet. He won the Valladolid International Film Festival Award for Best Actor for his performance in the film. He next appeared in the films The Firm (1993) and Needful Things (1993), before portraying the lead role of Kyle Bodine in the neo-noir film China Moon (1994). In 1995, Harris portrayed Watergate figure E. Howard Hunt in the Oliver Stone biopic Nixon, and received his first Academy Award for Best Supporting Actor nomination for his performance as NASA Flight director Gene Kranz in Apollo 13. The following year, Harris starred in and executive produced the television adaptation of Riders of the Purple Sage. Also in 1996, Harris returned to the Broadway stage, appearing as Major Steve Arnold in the Ronald Harwood play Taking Sides. In 1998, his co-starring role in The Truman Show earned him a second nomination for the Academy Award for Best Supporting Actor, and a Golden Globe Award for Best Supporting Actor – Motion Picture win. Harris made his directorial debut in 2000 with the drama biopic Pollock, in which he also starred as artist Jackson Pollock. He was nominated for his first Academy Award for Best Actor (and third Oscar overall) for his performance. To prepare for the role, he built a small studio in which to copy the painter's techniques. Two years later, Harris was nominated for his fourth Academy Award (third in the Best Supporting Actor category) for his role as Richard Brown in the British-American drama film The Hours. In between the two Oscar nominated roles, he appeared in the biographical drama A Beautiful Mind (2001) and portrayed German sniper Major Erwin König in the war thriller Enemy at the Gates (2001). For his lead role as Miles Roby in the 2005 miniseries Empire Falls, Harris was nominated for the Primetime Emmy Award for Outstanding Lead Actor in a Miniseries or a Movie and the Golden Globe Award for Best Actor – Miniseries or Television Film. He then appeared as a vengeful mobster in David Cronenberg's A History of Violence (2005). In 2006, he portrayed composer Ludwig van Beethoven in the film Copying Beethoven, and starred in the television documentary film The Armenian Genocide as American diplomat Leslie Davis. He next appeared alongside Casey Affleck and Morgan Freeman in the Ben Affleck-directed neo-noir mystery film Gone Baby Gone (2007). Harris then co-starred as the antagonist Mitch Wilkinson in National Treasure: Book of Secrets (2007), alongside Nicolas Cage. In 2010, he and wife Amy Madigan appeared together in Ash Adams' independent crime drama Once Fallen. Later that same year, Harris starred in the survival drama The Way Back as Mr. Smith. His performance received much critical praise, and he was suggested by critics to receive a fifth Oscar nomination. In 2012, he co-starred alongside Sam Worthington in the thriller film Man on a Ledge for Summit Entertainment. He then won the Golden Globe Award for Best Supporting Actor – Series, Miniseries or Television Film and was nominated for the Primetime Emmy Award for Outstanding Supporting Actor in a Miniseries or a Movie for his performance as Senator John McCain in the HBO made-for-television drama Game Change. The following year, he appeared in the western thriller Sweetwater, and starred opposite Annette Bening in the romantic drama film The Face of Love. Harris then voiced Mission Control in Alfonso Cuarón's sci-fi epic Gravity (2013), starring Sandra Bullock and George Clooney. In 2015, he portrayed the title character in the film version of the Shakespeare tragedy Cymbeline. In 2016, he appeared alongside Madigan and Taissa Farmiga in The New Group's revival of Sam Shepard's Buried Child, for which he was nominated for the Lucille Lortel Award for Outstanding Lead Actor in a Play. Harris is then set to co-star in James Franco's In Dubious Battle, based on the novel of the same name by John Steinbeck. Also in 2016, he portrays the villainous Man in Black in HBO's sci-fi thriller series Westworld, and had a co-starring role in the ensemble cast of Warren Beatty's romantic comedy-drama Rules Don't Apply, with Lily Collins and Alden Ehrenreich. In 2017, he is set to appear in Dean Devlin's sci-fi film Geostorm, alongside Gerard Butler and Andy García. That same year, Harris will star in Alejandro González Iñárritu's Starz drama series The One Percent with Hilary Swank and Ed Helms. Harris has been cast in Darren Aronofsky's untitled drama film, alongside Jennifer Lawrence and Domhnall Gleeson. On March 20, 2012, the Screen Actors Guild (SAG) and the American Federation of Television and Radio Artists (AFTRA) completed a merger of equals to form a new union, SAG-AFTRA. Harris, along with Edward Asner, Martin Sheen, Valerie Harper, Michael Bell, and Wendy Schall (to name a few) were adamantly opposed to such a merger and filed a lawsuit against SAG President Ken Howard and several SAG Vice Presidents, seeking to have the merger overturned and the two unions separated to their pre-merger organizations. The lawsuit was dismissed on May 22, 2012. 1980 Borderline Hotchkiss "the Marine"
1976 Gibbsville Steve Episode: "Trapped"
1977 Delvecchio Davey Bresnihan Episode: "Cancelled Contract"
1978 The Rockford Files Rudy Kempner Episode: "Kill the Messenger"
1978 David Cassidy: Man Undercover Ben Episode: "Deadly Convoy"
1979 Barnaby Jones Glenn Morgan Episode: "School of Terror"
1980 Paris John Dantley Episode: "America the Beautiful"
1981 CHiPs Lonny Episode: "Vegabonds"
1981 Hart to Hart Arnold Harmon Episode: "Hart of Darkness"
1984 American Playhouse Jimmy Wing Episode: "A Flash of Green"
1994 The Stand General Starkey Miniseries, episode: "The Plague"
1995 Frasier Guest Caller Rob Episode: "Leapin' Lizards"
1 2 3 4 5 6 "Ed Harris". Inside the Actors Studio. Bravo. 1 2 Barnes, Mike (February 16, 2014). "Bob L. Harris, Father of Actor Ed Harris, Dies at 91". The Hollywood Reporter. ↑ Stein, Ruthe (January 9, 2000). "Ed Harris Has the Righteous Stuff, Too: Actor plays a particularly convincing priest in `The Third Miracle'". San Francisco Chronicle. Retrieved December 10, 2007. ↑ Pearlman, Cindy (February 6, 2000). "Love the sinner: Harris repents for 'money' roles". Chicago Sun-Times. Retrieved December 10, 2007. ↑ Koenenn, Joseph C. (March 16, 1986). "Ed Harris: Inhabiting his characters". Newsday. ↑ Rohan, Virginia (June 18, 2007). "North Jersey-bred and talented too". The Record. Retrieved June 25, 2007. Ed Harris: Class of 1969, Tenafly High School. ↑ Stein, Ruthe (March 25, 2001). "They're Ready For Their Close-Ups: Camped out at Oscars, the starstruck wait to sneak a peek". San Francisco Chronicle. Retrieved May 31, 2007. She's hoping to score a seat near the front and catch the eye of Oscar nominee Ed Harris, who went to Tenafly High School in New Jersey with her mother. 1 2 Kachka, Boris (October 9, 2006). "Man, Oh, Man Ed Harris is not a control freak. Got that?". New York. ↑ "Ed Harris: Performer". Playbill. Retrieved November 13, 2015. ↑ Ebert, Roger (March 24, 1989). "Jacknife Movie Review & Film Summary". RogerEbert.com. ↑ Nassour, Ellis (October 16, 1996). "Ed Harris Seeks the Man Behind the Uniform". Playbill. ↑ "The Truman Show - 1998 Academy Awards Profile". Box Office Mojo. Retrieved November 13, 2015. ↑ Fleeman, Michael (January 24, 1999). "'Private Ryan', Spielberg Win Golden Globes". The Washington Post. ↑ Helmore, Edward (February 25, 2001). "Ed Harris: The ultimate splasher movie". The Guardian. ↑ Michael, David (February 12, 2003). "Ed Harris – The Hours Interview". BBC News. ↑ Hernandez, Ernio (May 28, 2005). "Philip Seymour Hoffman and Paul Newman Star in "Empire Falls" HBO Film, Debuts May 28-29". Playbill. ↑ "How Ed Harris learned Beethoven". BBC News. November 2, 2006. ↑ "Ed Harris Joins Ben Affleck's 'Gone, Baby, Gone'". MovieWeb. April 20, 2006. ↑ Brevet, Brad (March 28, 2007). "Mirren and Harris Join 'National Treasure 2'". ComingSoon.net. ↑ Lopez, John (November 11, 2010). "Could Ed Harris Finally Win an Oscar for The Way Back?". Vanity Fair. ↑ McNary, Dave (October 29, 2010). "Ed Harris joins Summit's 'Man on a Ledge'". Variety. ↑ Rose, Lacey (March 23, 2011). "Ed Harris to Play John McCain in HBO's 'Game Change'". The Hollywood Reporter. ↑ Fleming Jr, Mike (April 17, 2012). "January Jones And Ed Harris Star In 'Sweetwater'". Deadline.com. ↑ McClintock, Pamela (February 8, 2011). "Diane Keaton, Ed Harris to Star in 'Look of Love'". The Hollywood Reporter. ↑ Cochran, Amanda (March 8, 2014). "Did you spot Ed Harris in "Gravity"?". CBS News. ↑ Kroll, Justin (August 5, 2013). "Ed Harris to Co-Star With Ethan Hawke in 'Cymbeline'". Variety. ↑ Gerard, Jeremy (October 8, 2015). "'American Horror Story's Taissa Farmiga Joins Ed Harris, Amy Madigan In 'Buried Child' Revival". Deadline.com. ↑ Kroll, Justin (January 30, 2015). "James Franco Assembles Cast for Adaptation of 'In Dubious Battle'". Variety. ↑ Stedman, Alex (August 11, 2014). "Ed Harris Joins HBO's 'Westworld' as Key Villain". Variety. ↑ Kit, Borys (August 15, 2014). "Jim Sturgess, Abbie Cornish in Talks to Join Gerard Butler in 'Geostorm' (Exclusive)". The Hollywood Reporter. ↑ Andreeva, Nellie (July 22, 2014). "Ed Helms, Hilary Swank & Ed Harris In Talks To Star In Alejandro González Iñárritu's MRC Series 'One Percent'". Deadline.com. ↑ McNary, Dave (April 15, 2016). "Domhnall Gleeson, Michelle Pfeiffer Join Jennifer Lawrence in Darren Aronofsky Drama". Variety. ↑ "Biography: Ed Harris". Lifetime. Retrieved November 13, 2015. ↑ Handel, Jonathan (February 27, 2012). "SAG/AFTRA Anti Merger Lawsuit Drops Demands". The Hollywood Reporter. ↑ Handel, Jonathan (May 22, 2012). "Dismissal Formalized in SAG-AFTRA Merger Lawsuit (Exclusive)". The Hollywood Reporter. ↑ Saval, Malina (March 13, 2015). "Ed Harris Receives Star on the Hollywood Walk of Fame". Variety. 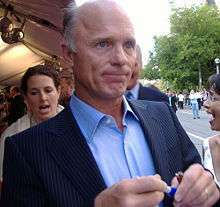 ↑ "Ed Harris | Hollywood Walk of Fame". www.walkoffame.com. Retrieved 2016-09-21. ↑ "Dr. Ronald Crutcher, national leader in higher education, announced as Commencement Speaker". Muhlenberg College. April 29, 2015.